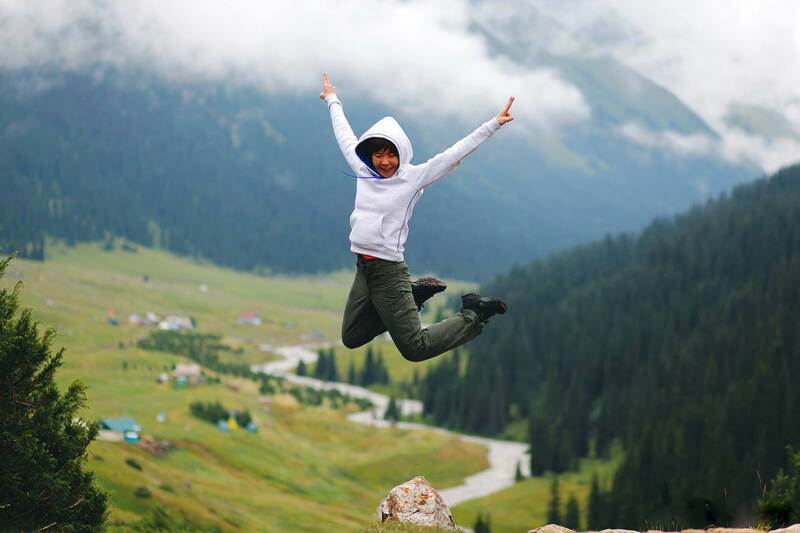 Relish in unspoiled nature, stay in nomadic yurt, witness traditional nomad games, and feel the warmth of local hospitality in beautiful Kyrgyzstan – a land-locked country in Central Asia. 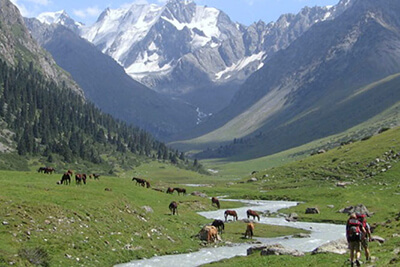 Located along the ancient Silk Road, Kyrgyzstan is a crossroad for people of various origins and traditions, yet the prevailing culture is that of a nomadic lifestyle shaped by the natural surroundings. Kyrgyz shepherds move around with their flocks of animals according to seasons, living in tent-like homes called yurts; there’s a saying that goes “only in death, when he is buried, that a Kyrgyz stops wandering”. Head for Chong-Kemin Valley. En-route visit an important point on the ancient Silk Road — the Burana Tower architectural complex, dated back to the 10th century, monuments include a minaret, remnants of a castle, and ancient warrior cemetery. Enjoy lunch near Burana at a Kyrgyz family home. 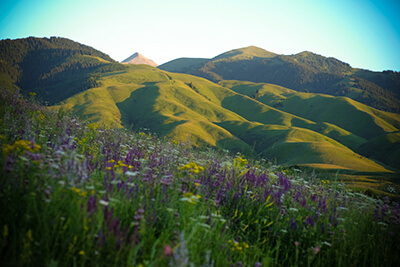 Overnight at home stay in Chong-Kemin, a serene village surrounded by green fields and wild flowers blooming in spring. Enjoy home cooked dinner with host family. 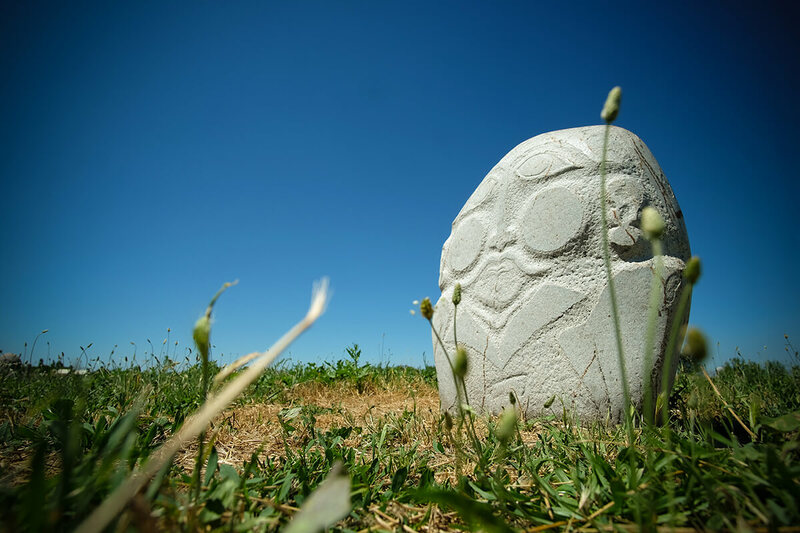 Today visit Cholpon-Ata’s open-air petroglyph gallery. 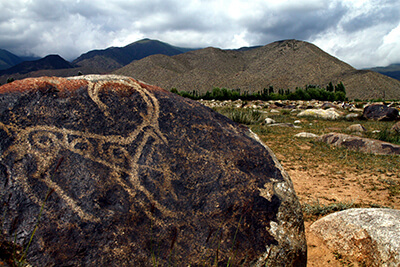 The rock paintings include hunting scenes dated between 800BC and 1200AD. 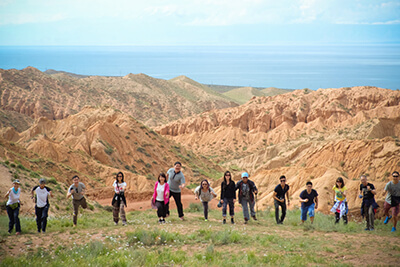 Around noon, arrive at the northern shore of Issyk-Kul, largest lake in Kyrgyzstan, its name means “warm lake”, it is surrounded by snow-capped peaks of Tienshan ranges, but never frozen-over in winter. Chill out by the beach after lunch. Late afternoon arrive in Karakol, visit Przhevalski Museum dedicated to the famed Russian explorer of Central Asia and Tibet. Overnight at Karakol homestay. 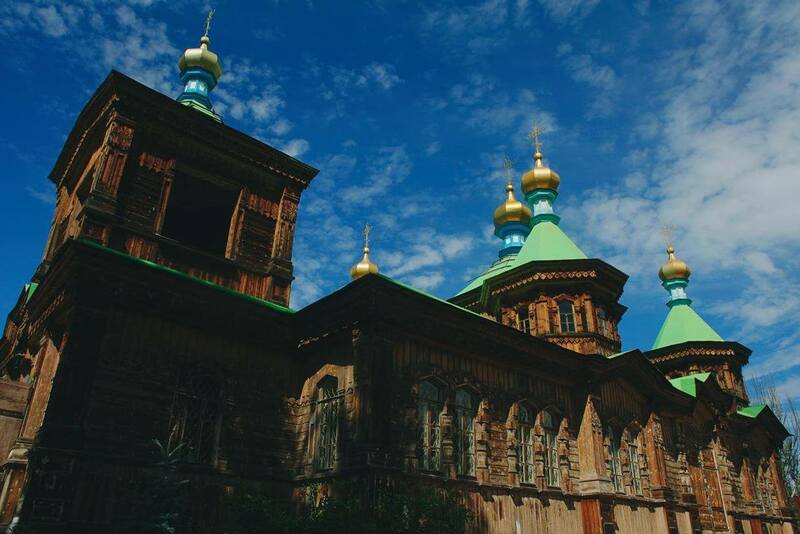 Morning visit the wooden church of Russian Orthodox in downtown before proceed to the foothill of Altyn-Arashan, then transfer by trailer bus (kamaz) to ascent 16km to 2435m above sea level. Enjoy picnic and hot spring bath in the mountains. Relish in unspoilt nature, view of rolling hills carpeted by alpine-forest, crystal clear river gushing by, greenery all around. 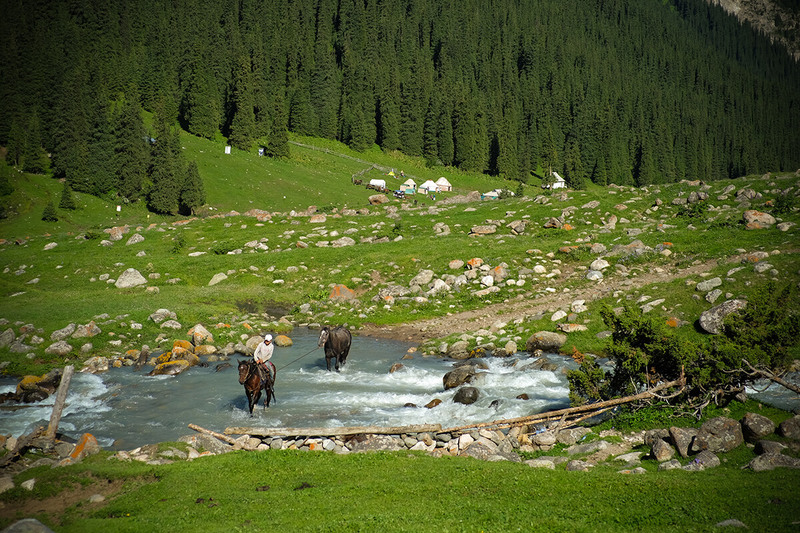 Overnight in a hut or yurt, enjoy the serenity of the mountains, and counting stars at night. Wake up to fresh air and the sound of nature, enjoy a slow breakfast. Late morning depart from Altyn-Arashan, back in Karakol by lunch time, later, sight-seeing in city center. Sights of interest include Dungan mosque with distinct Chinese architectural designs, bustling local market, and wooden house in old quarter. Overnight in Karakol home-stay, enjoyed home cooked dinner. 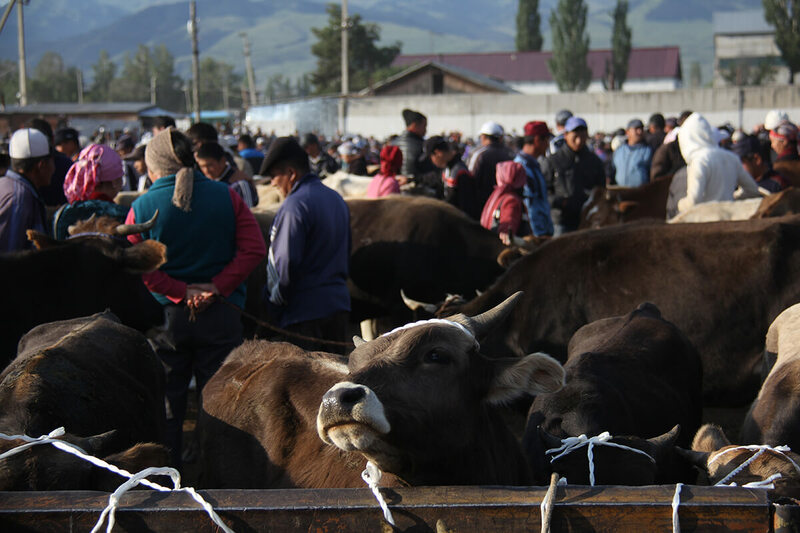 Early morning visit the weekly Sunday Animal Market, where various livestock and husbandry tools are sold, and services like fixing horseshoe are available. 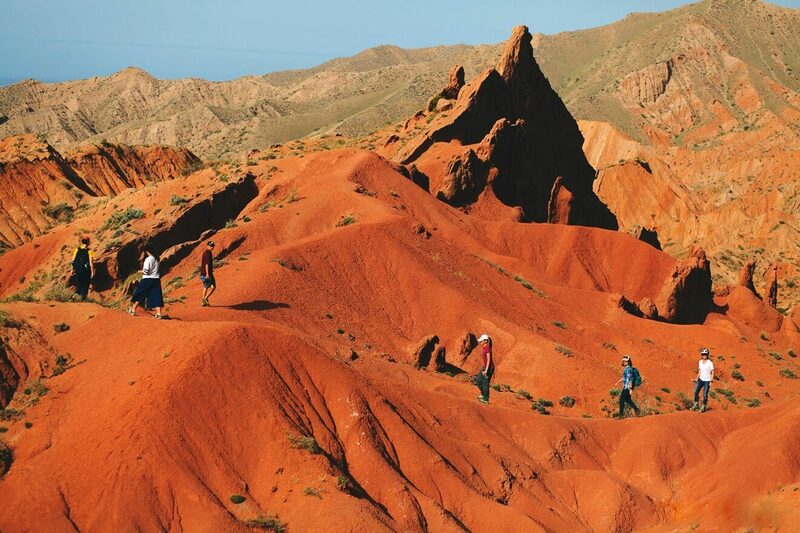 Later, drive to Jeti-Ögüz Gorge (Seven Bulls), named after huge flaming red rocks that resemble the shape of a bull. After picnic lunch, explore Skazka Canyons, admire fairy-tale-liked rock formations shaped by wind erosion. 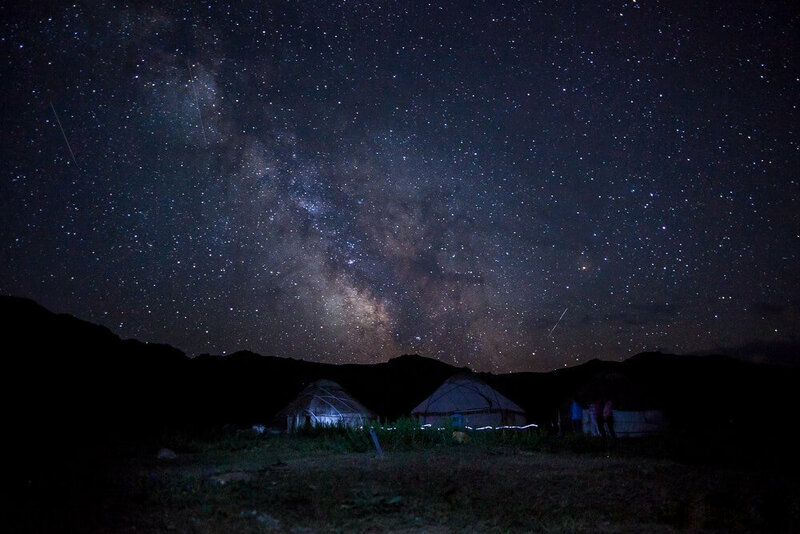 Overnight at Bokonbaevo yurt camp by the southern shore of Issyk-Kul. 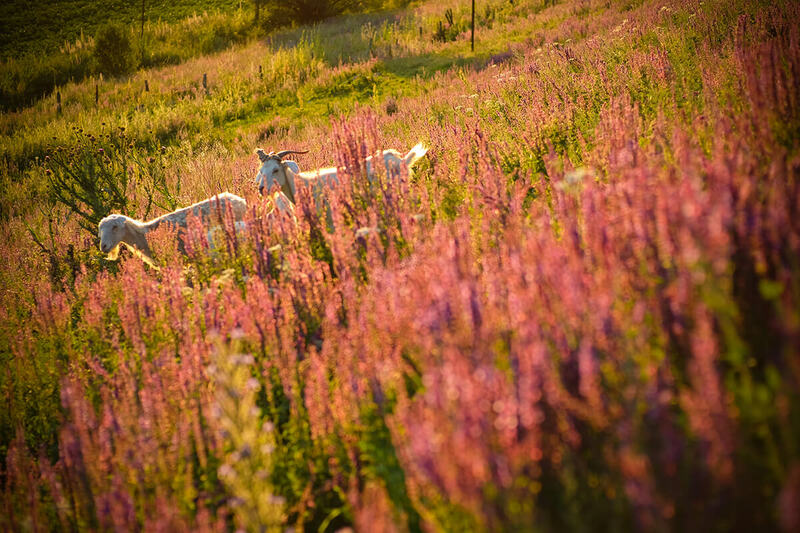 Spend a day at Jaicy farm with spacious grassland, and learn about traditional Kyrgyz games and skills. 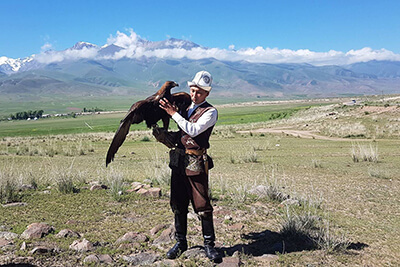 Eagle hunting demonstration in the morning, Kyrgyz hunter shows how eagles are trained to be hunting partner. Later, watch two teams of Kyrgyz horsemen compete in traditional game Buz Kashi; players manoeuvre with a goat’s carcass (replaced with a mould in modern-day), and score by putting it into the opponent’s ground. In “Tiyin Inmei” game, horseman pick-up stone while riding as fast as possible. 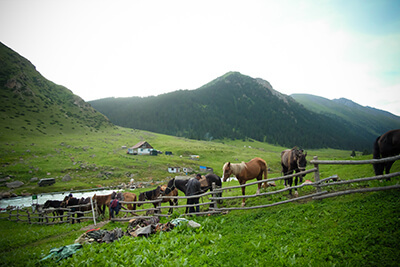 Tour members could also try horse riding (optional) on the grassland. After breakfast, drive to Vorontsovka, a village some 20km from capital city. 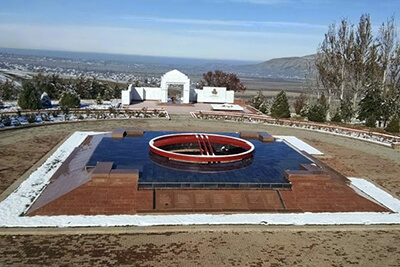 En-route visit Ata Beyit Memorial Complex dedicated to victims of revolt against Tsarist Empire in 1916, Stalin’s repression between 1934 – 38, and the 2010 revolution, learn about Kyrgyzstan past struggles in achieving independence and democracy. 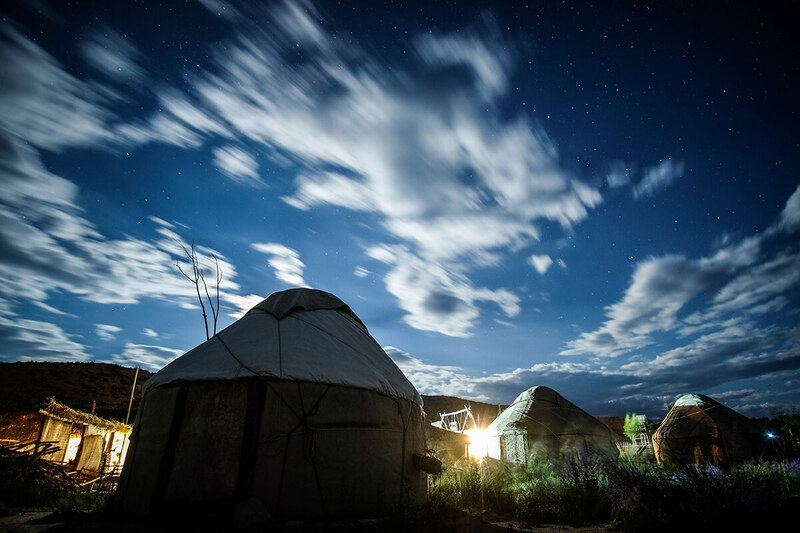 At night, stay at yurt camp in the village, enjoy folklore concert while having dinner. Morning drive to Ala Archa national park, enjoy half-day hiking in the gorge, admire view of endless mountains, forests, clear rivers. 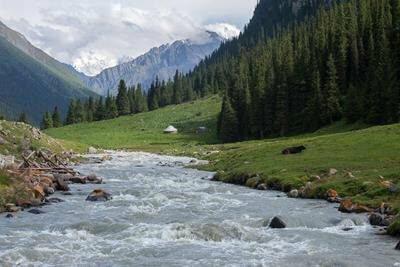 Later, transfer back to Vorontsovka village for lunch, rest and recuperate from the hike. 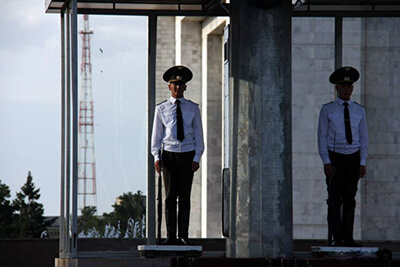 Late afternoon, drive back to Bishkek for stay at hotel. At night, there’s a wide selection of restaurants for dinner, including local food to international cuisine. One may also check out the city night life. 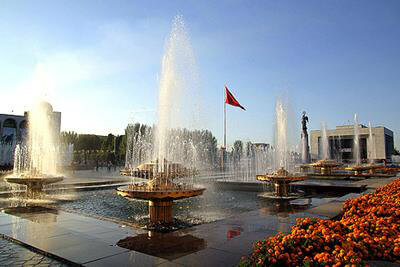 In the day, free & easy to explore Bishkek downtown; among the sights of interest are Victory Square, Tsum Center, Opera House, Central Square Ala Too, Panfilov Park, and the bustling local market Osh Bazaar. 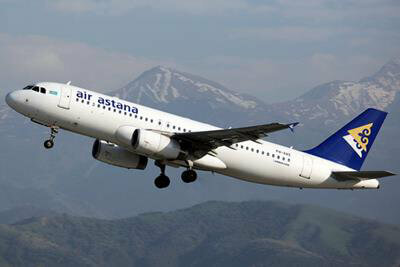 Late afternoon, transfer to the airport; board a flight heading to Kazakhstan for transit. Board a post-midnight flight from Kazakhstan back to Kuala Lumpur; arrive the same morning around 10am. End of tour. A non-refundable deposit (unless tour cancelled by LevArt) of RM1,500 is payable to secure booking. Balance fee RM 4,200 to be collected upon booking deadline or when the tour is fully booked. Accommodation mainly in home stay and yurt, for those used to urban living, the comfort level may seem compromised. At times, multiple sharing in a room, or mixed gender sharing, outside toilet & bath. These are part of the authentic experiences of the reality on the ground; please face them with open-mindedness and understanding. For topography reason, weather in Kyrgyzstan varies from place to place, and the day and night temperature gap is huge; temperature could range from 5 Celsius to 28 Celsius. Mindful to keep warm and apply sun protection. During road trip excursions, en-route lack of modern toilet, will make “bush stops” for tour members to answer their nature’s call in the wild. Leisure hike on D6 & D9, average fitness would do. The trip involves journeying through some bumpy unpaved road, if raining, vehicle may get stuck in muddy pool and require team work to get out of the situation. A nature lover, she guides forest tours, and started organic farming to lead a self-sustainable lifestyle. She’s interested in learning the relations between nature and humanity; she even traveled abroad to study the ancient ways of life of the American Indians. She believes nature shapes the culture and traditions of human life. 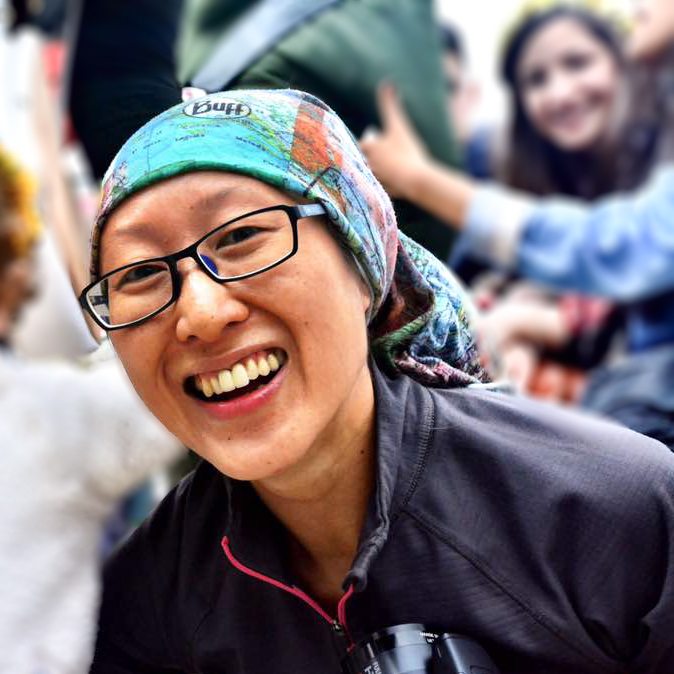 She thinks of travel as a process of cultural learning, which provides insights into human migration trail, just like the eco-system of a forest, where nature forces come in play. She cares about the world, not just the humankind, but also the nature and wildlife.